READ BY EMILIA FOX. 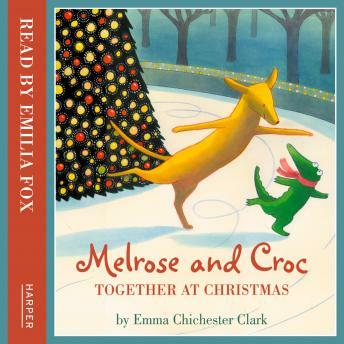 Melrose and Croc are two irresistible new characters from the creator of the popular Blue Kangaroo series, Emma Chichester Clark. READ BY EMILIA FOX. Melrose is a golden labrador and Croc is a tiny crocodile. The pair live together and share everyday experiences familiar to young children. This heartwarming story tells the tale of how the friends first meet on Christmas Eve. Melrose has just moved into a new flat and Croc has come to the city to meet Father Christmas. Both feel lonely and unhappy in the unknown city until beautiful music leads them to a chance encounter. All fans of Lily and Blue Kangaroo are sure to love this endearing duo.